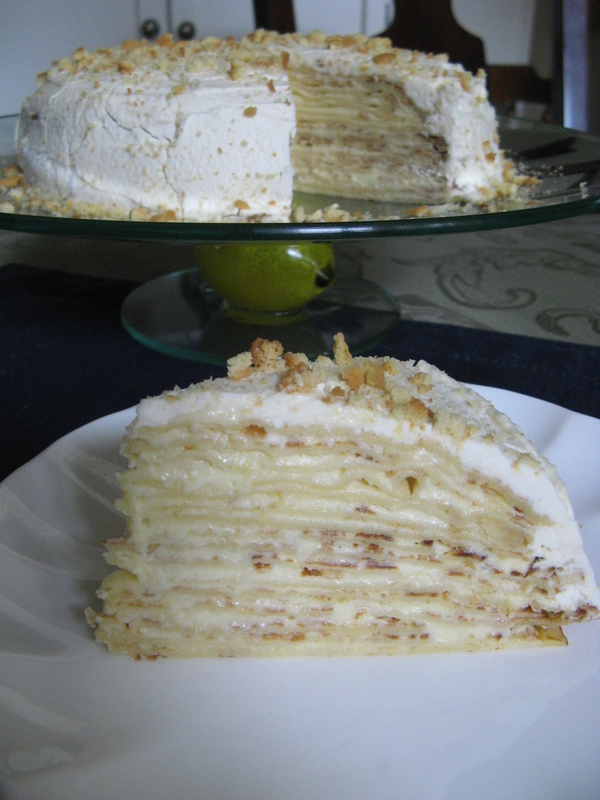 I’ve been wanting to make this Lemon Mascarpone Crepe Cake for over a year now. Somehow it just got away from me last summer and it almost did the same this summer. I truly feel the flavors of this cake are ideal for the summer months. This isn’t my first crepe cake though, last fall I made a Chocolate-Pumpkin Crepe Cake which was quite delish. Unfortunately this crepe cake wasn’t a hit amongst my friends who tried it. Not because of the taste but because they weren’t keen on the crepes. They agreed that the lemon curd cream filling between the crepes was good but the crepes themselves not so great. Not so much the flavor, but, the texture. Which I can completely understand. Eating a cake of crepes is nothing like eating a fluffy moist cake. I myself enjoyed it, but, I’m a texture person. In other words, I like sprinkles on my ice cream, nuts in brownies and cookies and so forth. 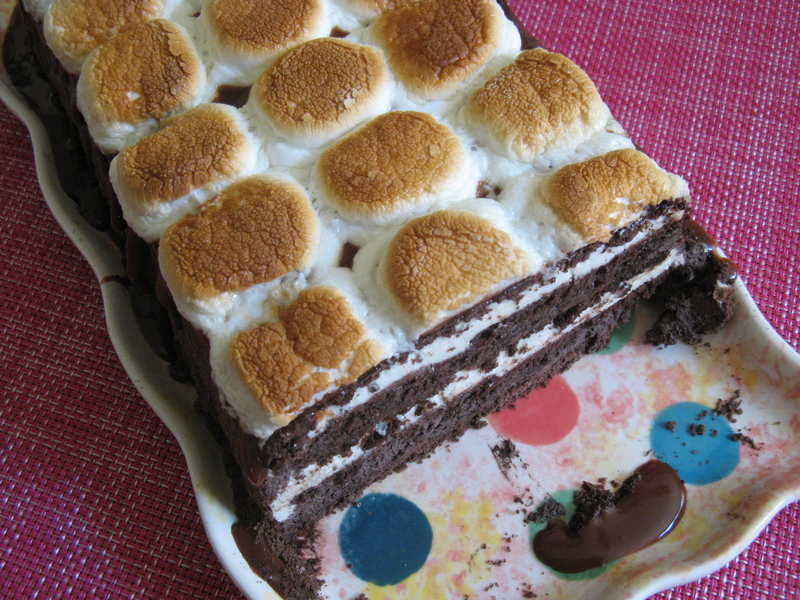 Oh well… You can’t always bake something that everyone will rave about. One thing I have to point out… This very apropos cake stand I used for this cake. 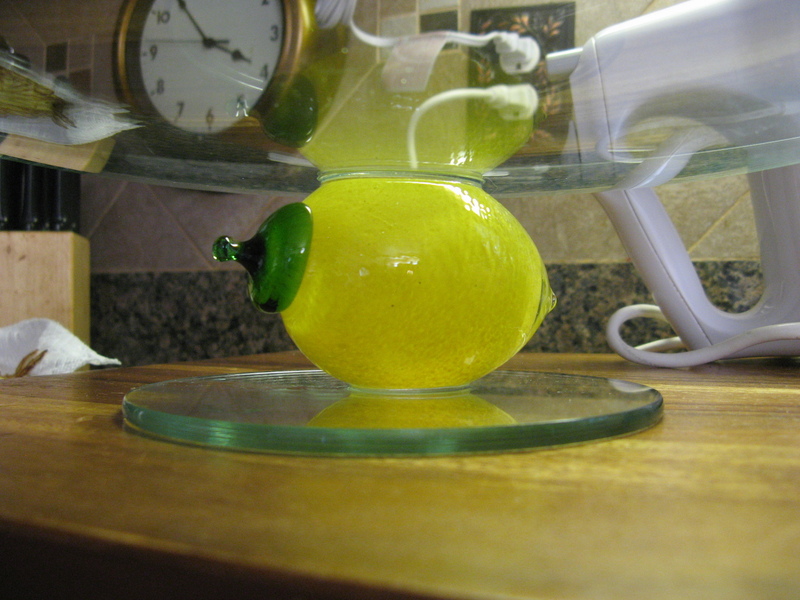 It has a glass lemon as the stem between the base and the plate. I got it from a dear friend’s mom a few days before I made this cake and it made making this cake a little more fun! *If you opt to use store bought lemon curd, you will need 1 cup. Lemon Curd: Beat together the butter and sugar on medium-high speed until light and fluffy. Reduce the speed to low and add the whole egg. Once well combined, gradually add in the egg yolks, then the lemon juice. The mixture may appear curdles. Transfer the mixture to a small saucepan and cook over medium heat, stirring constantly until the mixture is thick enough to coat the back of a wooden spoon, about 5 to 6 minutes. Transfer to a bowl and place a piece of plastic wrap directly on the surface and refrigerate until cool. You can keep the lemon curd in the refrigerator up to 1 week. Crepes: Combine all of the ingredients in a blender and puree until smooth, about 1 minute. Transfer to a bowl, cover and refrigerate for at least 2 hours and up to overnight. Once the batter is cold, stir it the batter until smooth again. Melt 1/2 teaspoon butter in a 10-inch skillet over medium heat. Pour about 1 ounce of batter on the skillet and tilt it to even distribute the batter. Cook until the edges on the crepe turn golden and then carefully flip and cook until just set. Transfer to a paper towel lined plate. Melt another 1/2 teaspoon of butter and continue cooking the crepes in the same manner. Mix the batter between each crepe. Stack the crepes on top of one another and let cool for 30 minutes. You will have between 16-20 crepes. Assembly: Beat 1 1/4 cups heavy cream with 3 tablespoons of confectioners’ sugar until soft peaks form. Fold a third of the whipped cream into the lemon curd with a rubber spatula until combined. 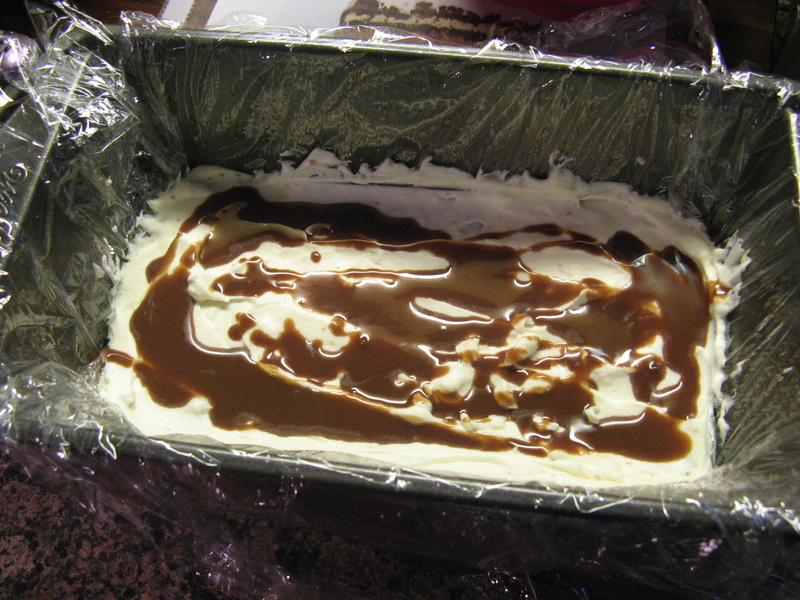 Then fold the cream-curd mixture into the remaining whipped cream until completely combined. 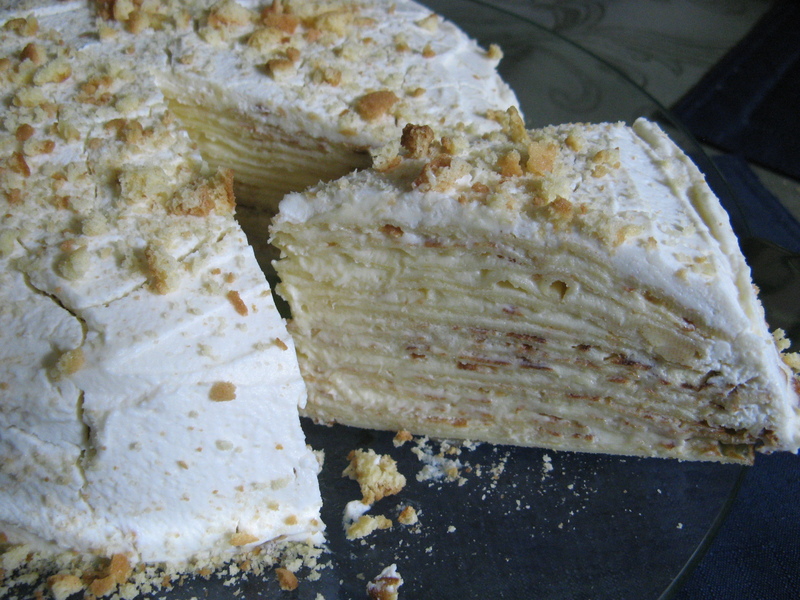 Place 1 crepe on the center of a cake stand and spread 3 tablespoons of the curd mixture evenly over the crepe. Repeat layering with remaining crepes and curd mixture, ending with a crepe. Whisk together the remaining cream and confectioners’ sugar with the mascarpone and vanilla extract until soft peaks form. Spread the mascarpone cream on the top and the sides of the cake. Refrigerate until set, about 2 hours. Let stand at room temperature for 30 minutes and garnish with crushed cookies before serving. I don’t have enough space in my kitchen to store all of my baking supplies so I keep them nicely organized on a shelving until in my basement. Not long ago while grabbing my Bundt pan to make a pound cake I thought it was about time I use my snack cake pans again. 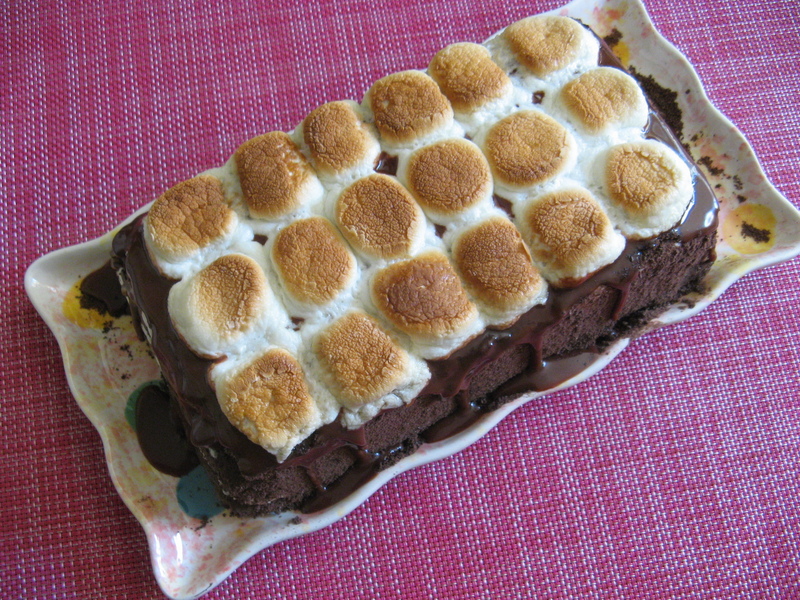 I’ve only used them once to make these Chocolate Snack Cakes. So, the wheels started turning to come up with a flavor. 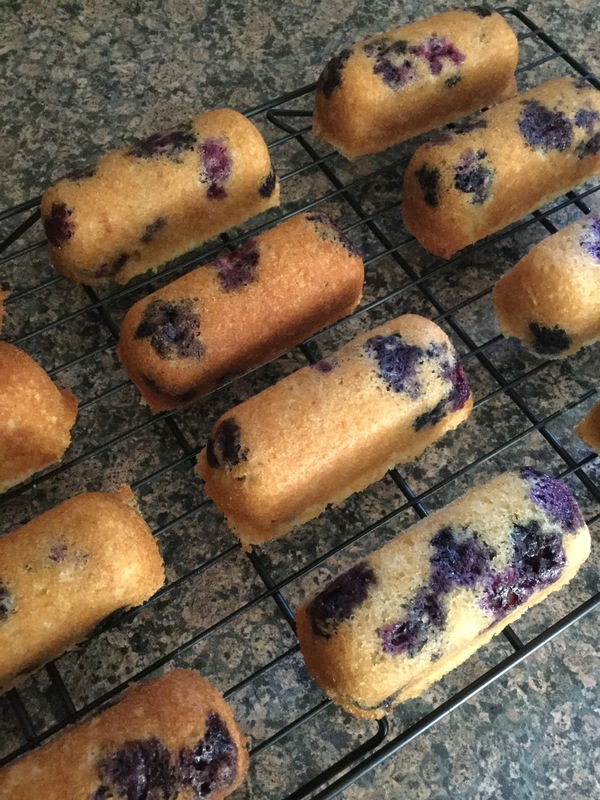 Initially I was thinking of making a Raspberry Cake with a Lime Curd Filling, then, it became a Raspberry Cake with a Lemon Curd Filling, next, a Lemon Raspberry Cake with a Pastry Cream filling, but, since blueberries were on sale the week I decided to make them it ended up being a Lemon Blueberry Snack Cake. Maybe another day will try out one of those other flavors. 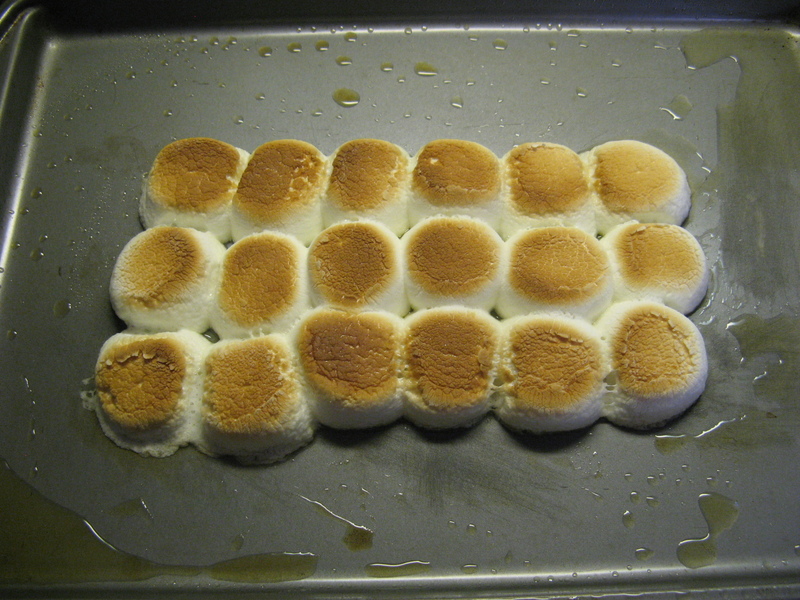 Oh, and in case you are wondering what a snack cake pan is, it’s essentially a pan that will make cakes that look like Twinkies. I have this one from Fat Daddio, which I believe isn’t available anymore, but, Wilton makes a similar one. 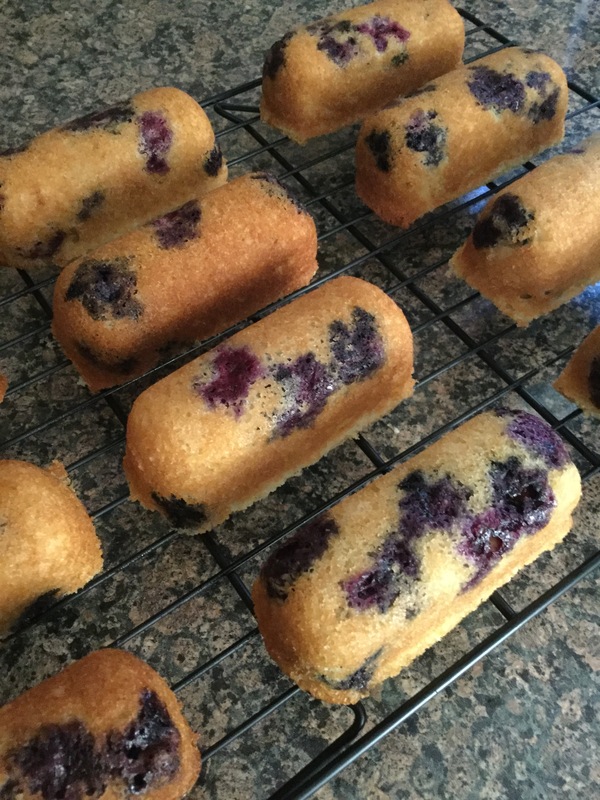 I tweaked the recipe that I used to make this Lemon Cake a few years back and then gently folded in blueberries that I dredged in flour (a little trick to ensure the blueberries won’t sink to the bottom of the batter while baking). I then divvied the batter among my snack cake pans and baked them in the oven. If you don’t have snack cake pans, you can use the batter to make cupcakes. They are delicious on their own, but, it you opt to make the cupcakes top them with cream cheese frosting and decorate with lemon zest and a few more blueberries for a little extra wow. *I made my own buttermilk by stirring together 4 1/2 teaspoons of white vinegar and 1 cup whole milk and let it sit for 10-15 minutes until it curdled. You can refrigerate the leftovers. 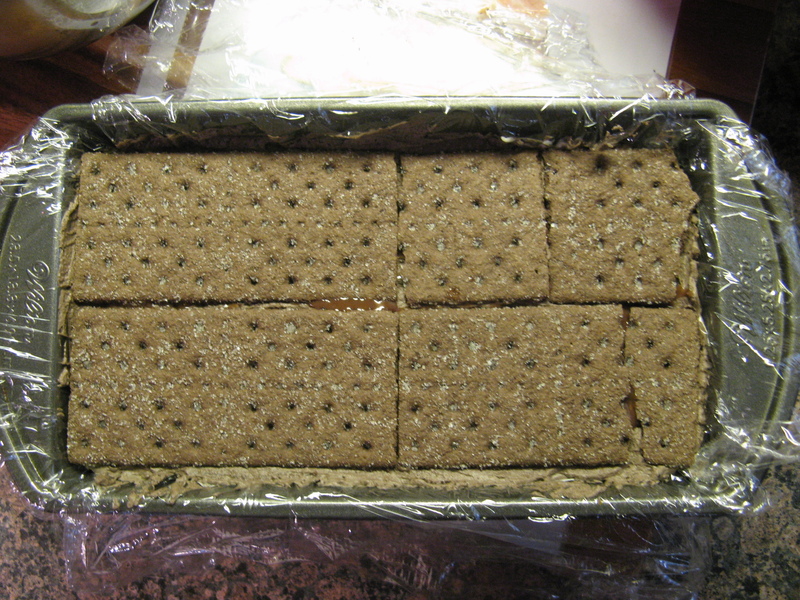 Preheat the oven to 350 F. Spray a snack cake pan with baking spray. If making cupcakes, line a cupcake tin with liners. Sift together the dry ingredients (flour, baking powder, baking soda & salt) and set aside. In a large bowl beat the butter and sugar on medium speed until light & fluffy, 3 to 5 minutes. Add the eggs 1 at a time, beating well after each addition. Add the flour mixture in 3 batches, alternating with the buttermilk and beat until just combined. Add in the lemon zest and vanilla extract. Fold in the blueberries and pour batter into the pan. 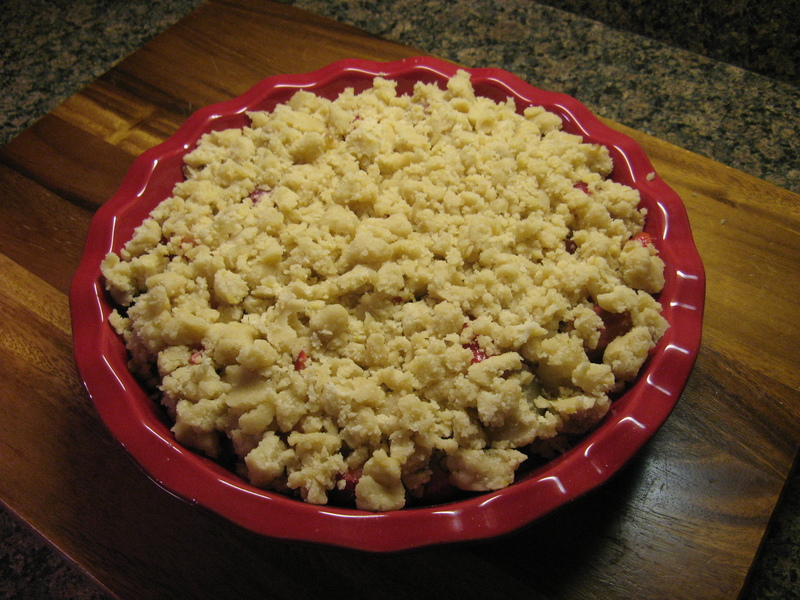 For the snack cake pan use about 3 tablespoons of batter per cavity, for cupcakes 1/4 cup of batter. 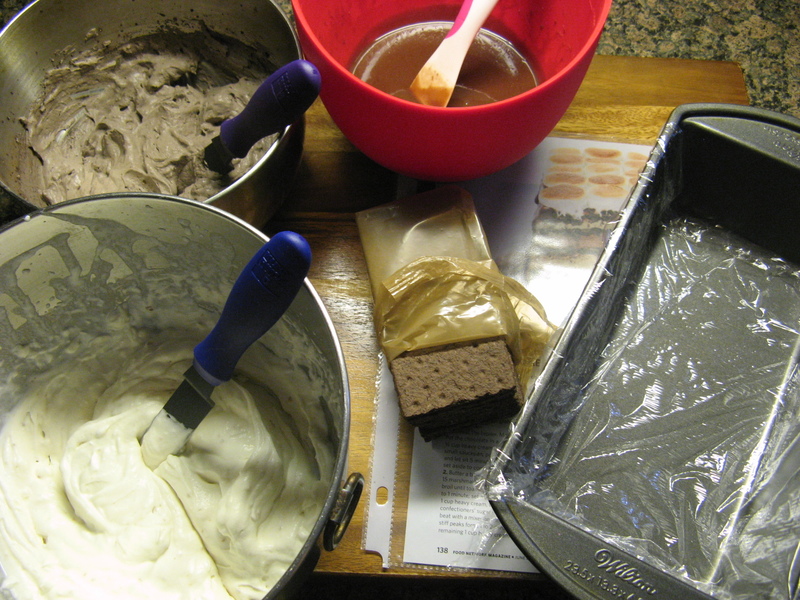 Bake for 18 – 20 minutes, or until a cake tester inserted in the middle comes out clean. Let cool in the pan for 5 minutes before transferring to a wire rack to cool completely. So, you may be wondering what exactly a Mille-Feuille is? I know I was wondering that when a friend tagged me in an Instagram post for Ree Drummond’s Marvelous Mille-Feuille. Translated from French it means one thousand sheets, layer, or leaves. Still wondering? 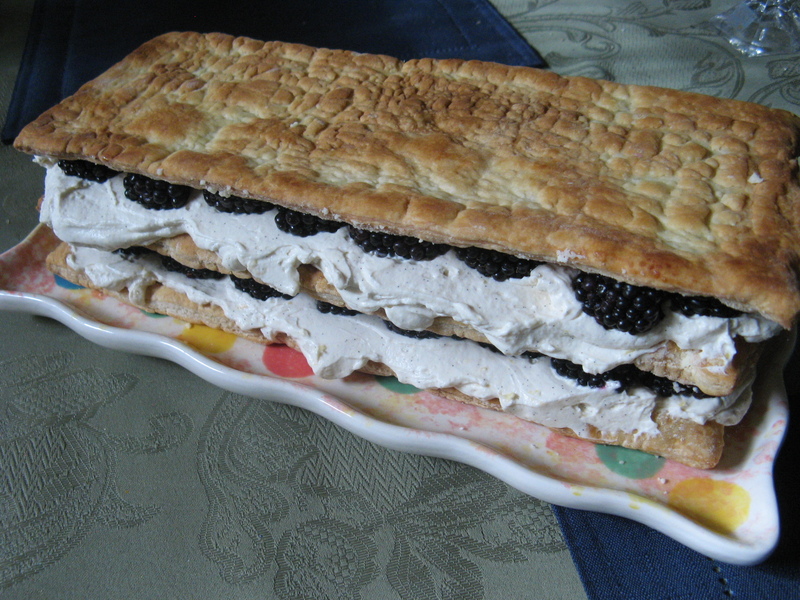 Well, it’s a dessert consisting of layers of puff pastry and cream… Think a Napoleon. 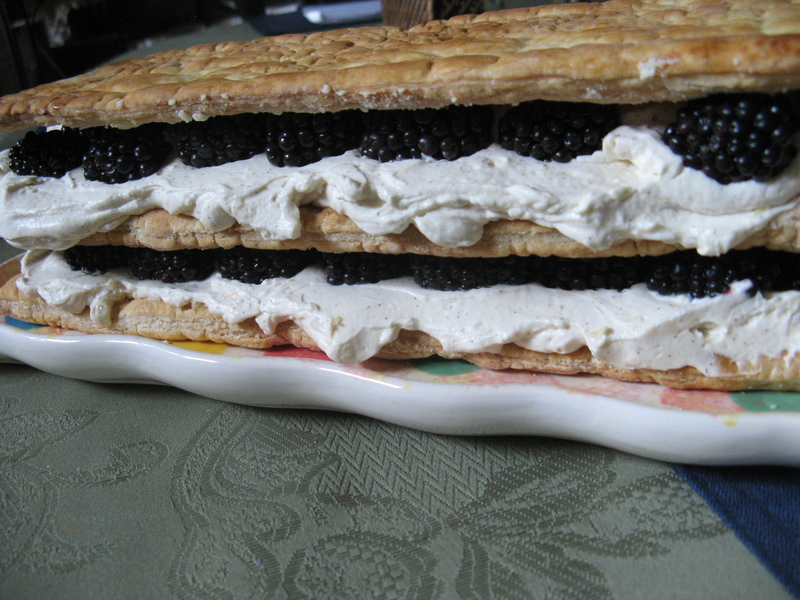 For this version though I added in some blackberries along with a custard made with mascarpone cheese… YUM! 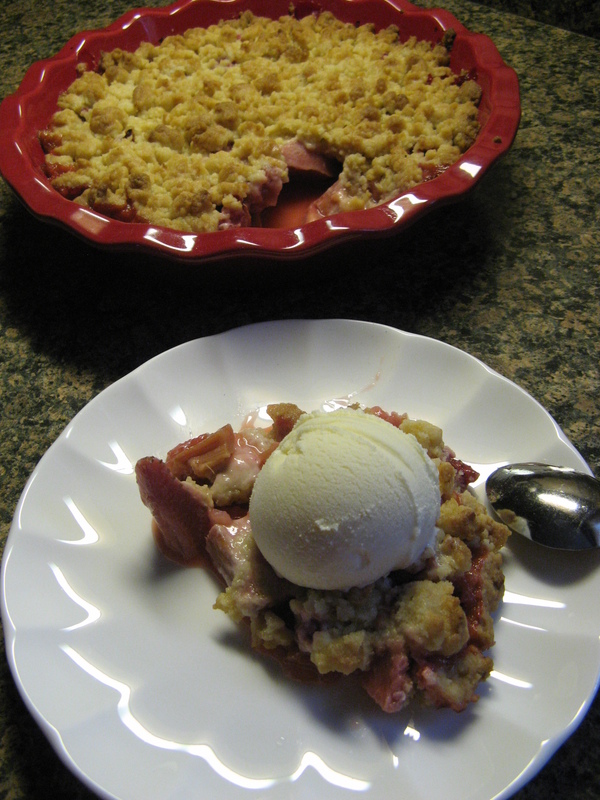 A slight variation from Ree Drummond’s as she used raspberries. Why did I use blackberries? Well, it was because the recipe called for raspberry liqueur and since I still had some blackberry liqueur from last year’s White Chocolate Blackberry Tiramisu I decided to swap out the berries. I began by thawing a frozen sheet of puff pastry according to the package directions – I used Pepperidge Farm’s Frozen Puff Pastry. Once it was defrosted I rolled it into a 12 x 15 inch rectangle and then cut it into three 12 x 5 inch rectangles. I placed the three pieces on a parchment lined baking sheet and pricked it with a work and then placed it in the refrigerator for 20 minutes (alternatively you could place it in the freezer for 10 minutes. And baked it in the oven from about 15 minutes. Until the puff pastry was a golden brown and puffy. I the transferred them to a wire rack to cool. While the puff pastry cooled, I made the filling. 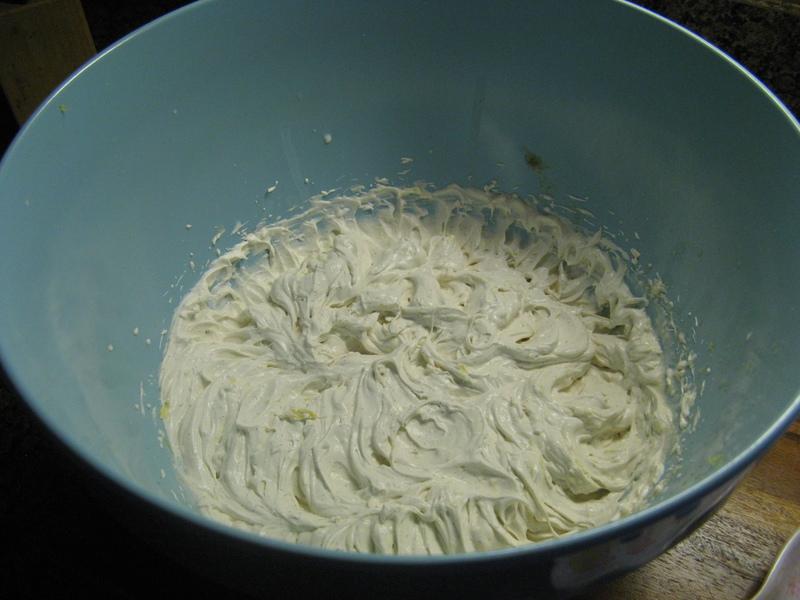 In the bowl of my stand mixer I added confectioners’ sugar, mascarpone cheese, heavy cream and vanilla paste and whisked it until soft peaks formed. I then added in the blackberry liqueur and lemon zest and whisked for a few more second until the ingredients were combined. It was then time to assemble. I placed a dab of the whipped mixture on a serving plate and place one of the puff pastry’s on the plate glaze-side down. 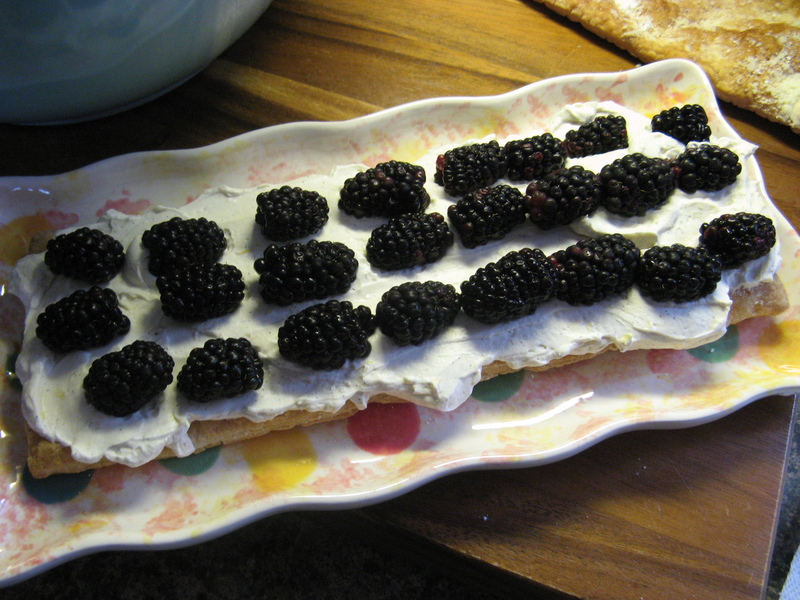 I spread half of the mascarpone mixture over the puff pastry and then arranged half of the blackberries on top. I repeated this with another puff pastry rectangle and the remaining mascarpone mixture and berries. 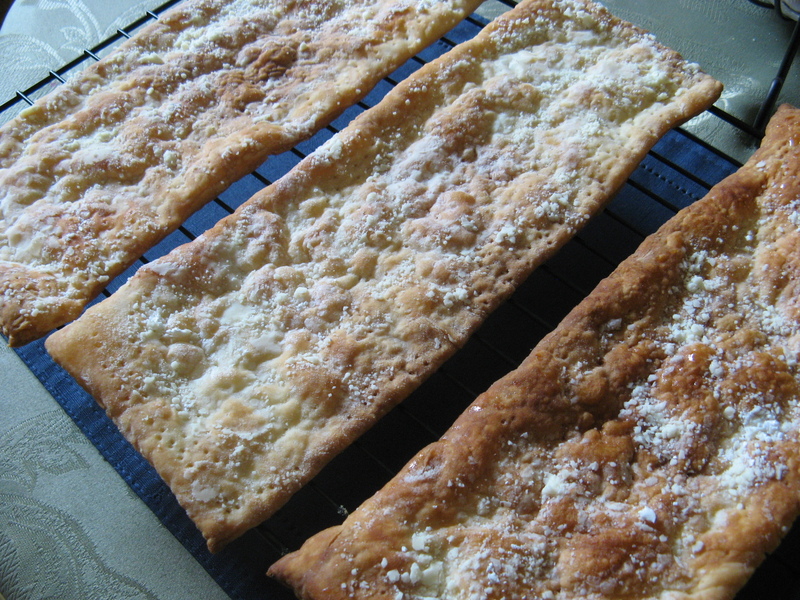 I then topped it with the remaining puff pastry rectangle and before serving I dusted it with more confectioners’ sugar. 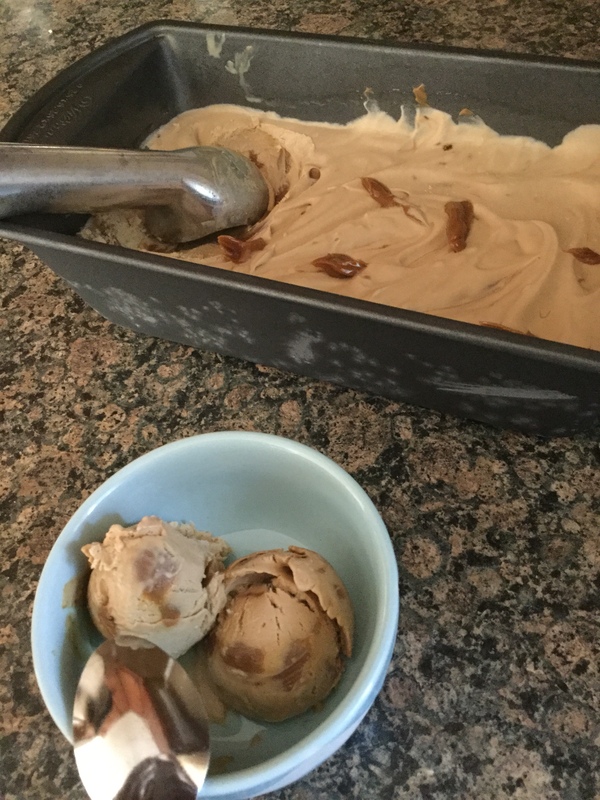 Verdict… It was a hit! 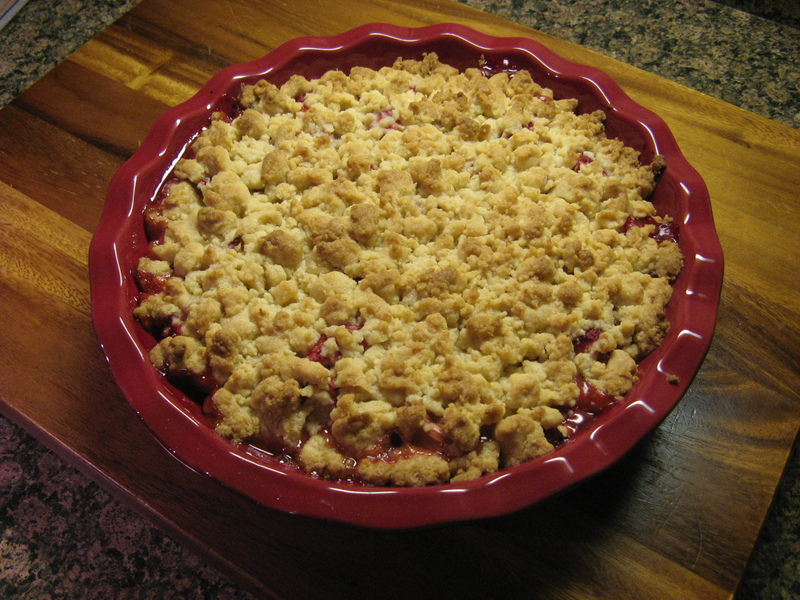 I can’t wait to make it again using freshly picked berries… Maybe I’ll try making it with raspberries next. 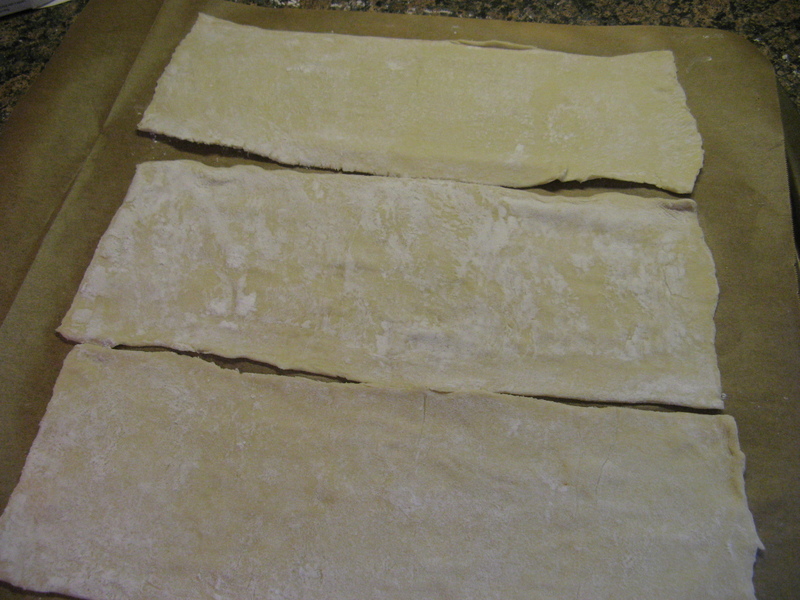 Unfold the pastry and roll it to a 12 x 15 inch rectangle and then cut into three 12 x 5 inch rectangles. Transfer to the prepared baking sheet and prick the pastry with a fork and chill for 10 minutes in the freezer or 20 minutes in the refrigerator. Dust the pastry with confectioners’ sugar and bake until golden brown and puffy, about 15 minutes. All to cool for about 15 minutes on a wire rack. In a bowl add the confectioners’ sugar, mascarpone, heavy cream and vanilla paste/extract, beat until soft peaks form – If using a stand mixer use the whisk attachment. Add the blackberry liqueur and lemon zest and continue mixing for an additional 10 seconds to ensure the ingredients are all combined. To Assemble: Dab a dollop of the mascarpone mixture on the serving plate and place one piece of the pastry on the plate – glaze-sized down (the side you sprinkled the sugar on). Spoon half of the mascarpone mixture on the pastry and smooth it out evenly. Arrange half of the blackberries on top and repeat with another piece of pasty and the remaining mascarpone mixture and blackberries. 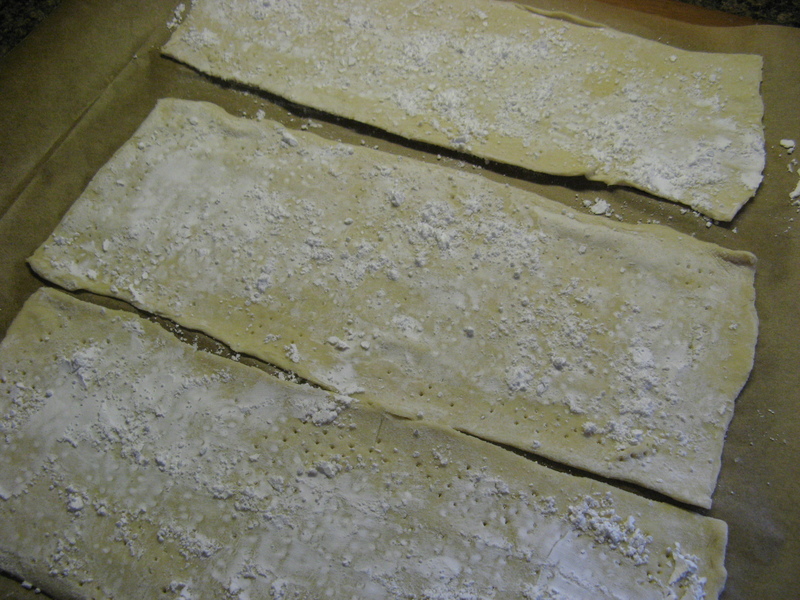 Top with the remaining pastry piece and dust with confectioners’ sugar. Happy First Day of Summer! 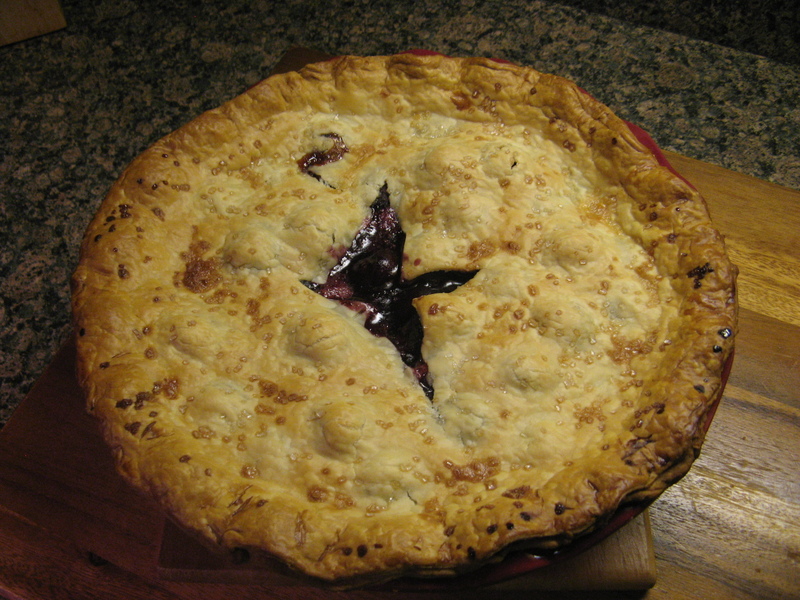 You may recall back in March I posted a Blueberry Pie in honor of Pi Day and that it was the first time I ever had Blueberry Pie, well, another confession. I’ve never had Cherry Pie. So, what better way to celebrate the start of the summer and cherry season than with a Cherry Pie! First things first… Since I was using fresh cherries I had to pit them. I don’t own a cherry pitter so I pitted the cherries by using a reusable plastic straw. I literally just pushed the straw through the cherry to remove the pit. 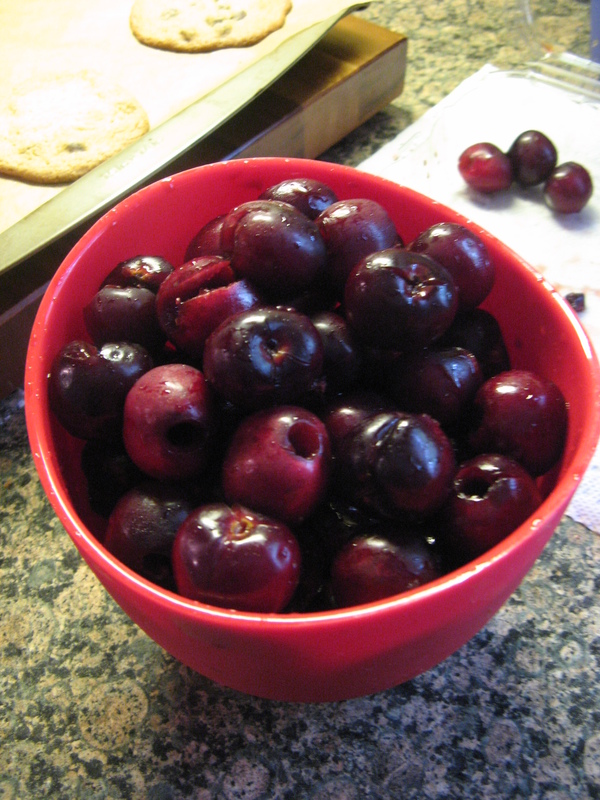 Check out this link for a few more ideas on how to pit cherries without a cherry pitter. 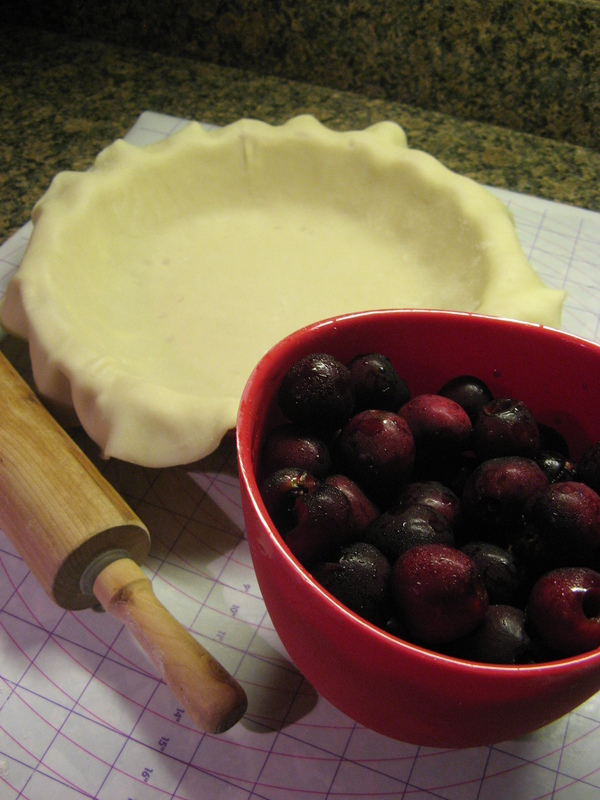 You may recall I’m not a fan of making pie crust from scratch – one of these days I will attempt to make it again – so I used my usual Pillsbury Pie crust. I rolled out one of the crusts an extra inch or two and then placed it in the bottom of my pie dish. 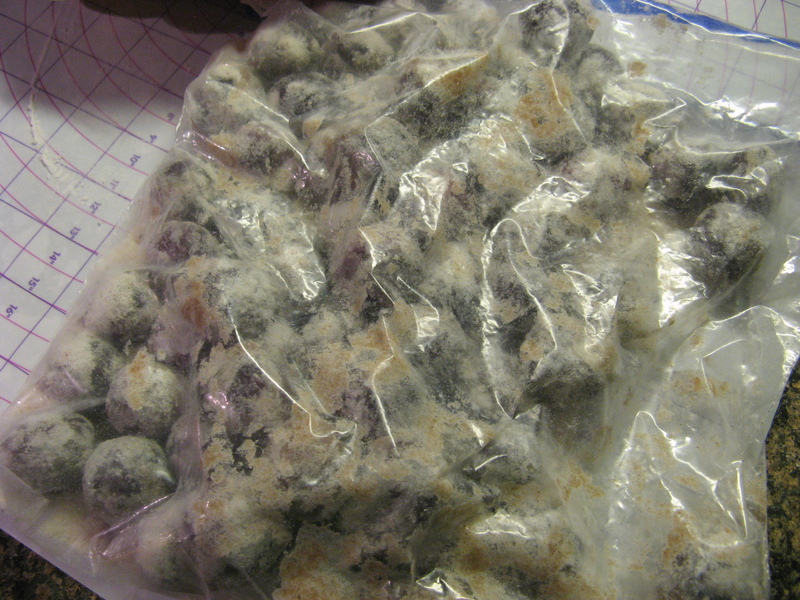 To prep the filling, I mixed flour, sugar and cinnamon in a Ziploc bag and then added in the cherries and tossed them around in the mixture to make sure they were completely covered. I then poured the mixture, along with the excess flour mixture, into the pie plate. 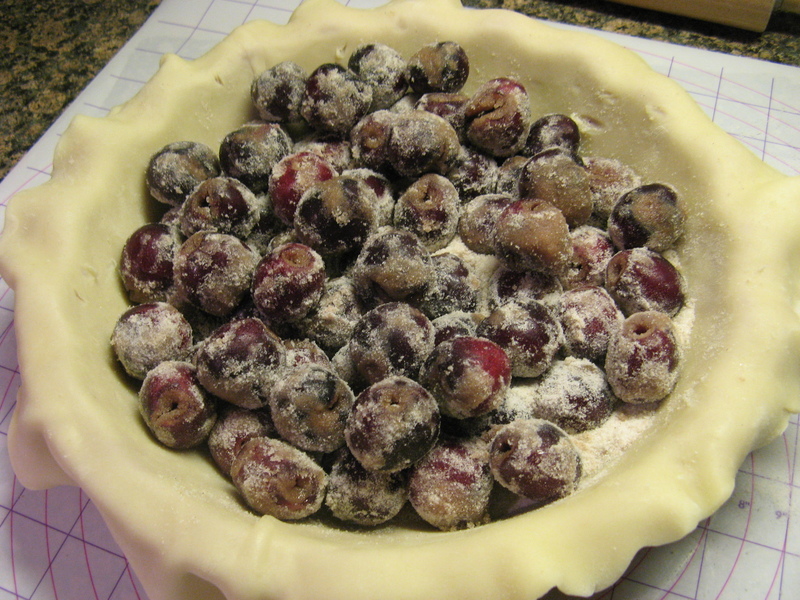 Next, I used the second pie crust to top the pie and brushed it with milk and sprinkled sugar on it. I then baked it in a 425 F preheated oven for 25 minutes and then lowered the oven temperature to 350 F and baked it for an additional 30 minutes. Until the filling was bubbling. While my crust did come out a little wonky looking, it didn’t take away from how delicious the pie was. 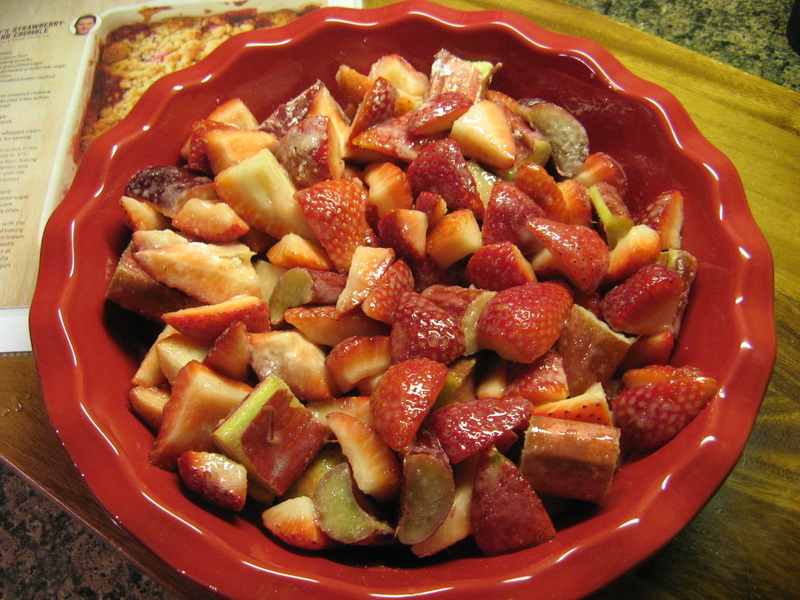 There’s something to be said about using fresh fruit… YUM! Place the second crust on top and trim the ends. 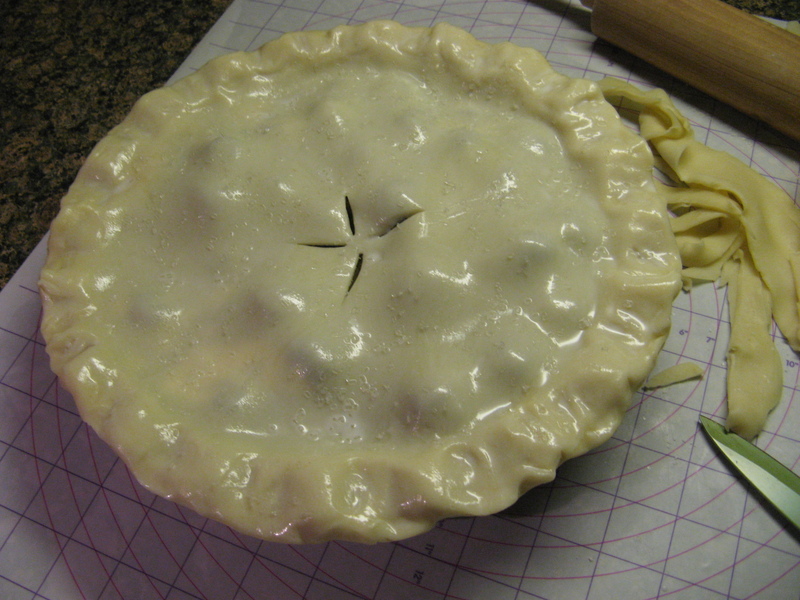 Cut vent slits in the middle of the pie and crimp the edges. Bake for 25 minutes and then lower the oven temperature to 350 F and bake for another 25 to 30 minutes. If the edges of the pie begin to brown too quickly, tent the pie.